Several years ago I purchased Rafael Moro's Arboles de Madrid (2007) in a Madrid bookstore. Since then I have meant to share with you partial entries from the book. Today I will begin to do so as part of an occasional series titled after the book. Today's tree is Aligustre del Japon also known as Ligustrum lucidum or glossy privet. * The fruit of the glossy privet is used to create reddish-brown dyes and is used to change the color of wines, making them appear more mature. I had a customer this week looking for a whole list of fragrant plants including Ligustrum. I did not tell him what I thought of its flower's fragrance. Because of your comment I searched for information about the flower and hort.ufl.edu describes it as "unpleasant" and Taylor's Master Guide to Gardening (2001) describes the fragrance as "strong...that some people enjoy and others find offensive." 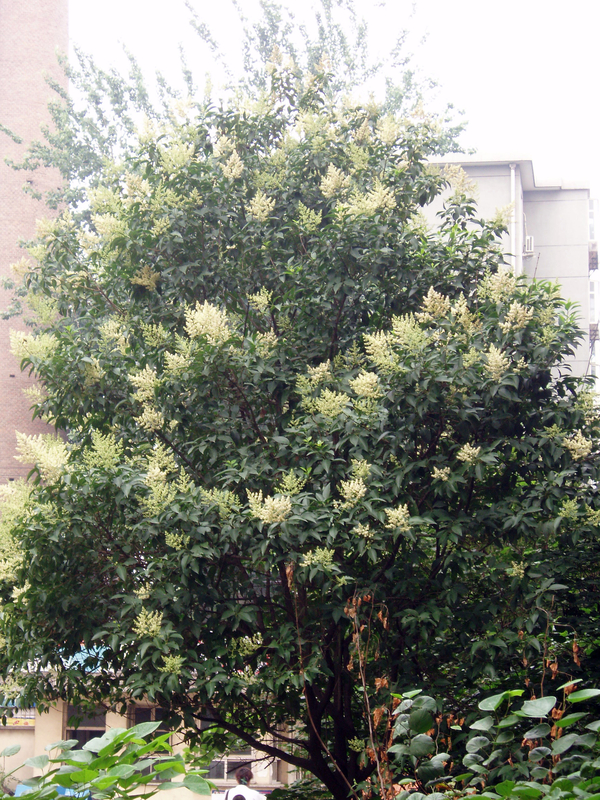 Is the glossy privet flower like a ginkgo fruit when it comes to odor?